Successfully Added Automatic Air Inflator Pump - 150PSI, Backlight LCD Display, Flashlight, Portable Design, 500mAh Battery to your Shopping Cart. With the Cycplus Automatic Air Inflator pump, a soft tire will never stand in your way again. Thanks to its powerful design, this air inflator is capable of filling up your bicycle tires in absolutely no time. Supporting a maximum charging pressure of 150 PSI, this electronic gadget offers an efficient and fast way to fill up the tires of your bike – allowing you to safely continue your trip. Coming with an intergraded LCD display, this air pump keeps you constantly updated about the current air pressure of your tires as well as the applied charging pressure. Its smart design allows this automatic air inflator to switch off automatically whenever your tire reaches the ultimate air pressure – ensuring that you’ll never damage your bicycle. Featuring a simple design, it efficiently lets you adjust the charging settings with the press of a button. 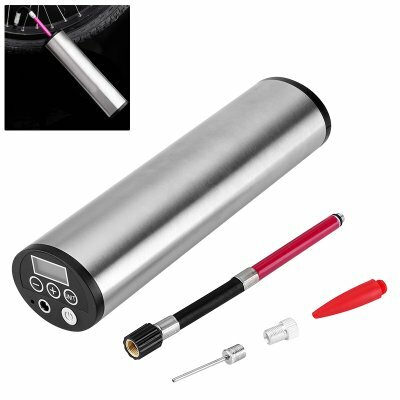 With this automatic inflator, anybody will be able to apply the perfect air pressure on their tires and enjoy a remarkably smooth bike ride. This cool gadget furthermore features a built-in LED flashlight that provides you with light in the darkness – allowing you to inflate your tires even after dark. Additionally, it supports backlight technology – ensuring that you’ll be able to clearly read all information portrayed on its LCD display at any time of the day. This Automatic Air Inflator comes with a 12 months warranty, brought to you by the leader in electronic devices as well as wholesale electronic gadgets..
Arabic: - Inflator الهواء التلقائي - Chinese Simplified: - 自动空气充气泵 - Czech: - Automatické vzduchu hustilka - Danish: - Automatisk luft inflation - Dutch: - Automatische Air Inflator - French: - Gonfleur Air automatique - German: - Automatische Luft Inflator - Hebrew: - וסת פרסיזיון אייר אוטומטי - Hindi: - स्वत: हवा Inflator - Italian: - Gonfiatore automatico dell'aria - Japanese: - 自動空気インフレーター - Korean: - 자동 공기 부풀리는 장치 - Malay: - Inflator udara automatik - Norwegian Bokmål: - Automatisk luft Inflator - Romanian: - Automate aer Inflator - Russian: - Автоматический воздушный насос - Spanish: - Inflador de aire automático - Thai: - ลมอากาศอัตโนมัติ - Turkish: - Otomatik hava şişirme - Vietnamese: - Xe máy tự động.